The inspiration for Xenogeneic: First Contact emerged from our fascination with space. Caught up in that yearning is the anticipation of what we might find out there and the uncertainty as to whether what we might discover would be friendly or not. There is always the question of what might motivate an alien species to seek personal contact with us here on Earth. This story looks at an alien group that has lost their own civil war and now need a new home, one they can dominate. 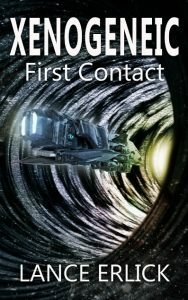 The story centers on Dr. Elena Pyetrov’s encounter with these aliens and how she seeks to interact with them and prevent the annihilation of the human race. For the lead character, Dr. Elena Pyetrov, I came upon a reluctant scientist and explorer. She’d lost her father to space exploration and resented his absences while she was growing up. Yet she continued in his footsteps. The obstacles she had to overcome to get her space mission off the ground gave her the determination and resilience to deal with the aliens she meets. Because of feeling abandoned as a child, Elena takes the responsibility for a young half-sister she discovers in the caves. This commitment leads her to have a chance to overcome the obstacles the aliens throw at her. For the aliens, I looked at what would bring them to our solar system. The idea of having to leave home and not return came as quite motivating. It was rather like the Puritans who left England for Massachusetts. They, too, felt the need and motivation to travel a great distance to a new land in order to hold true to their values. So was born the Knoonk.